Palestinian President, Mahmoud Abbas, conducts his first visit to Kuwait for the first time since the Iraqi invasion of Kuwait in 1990, and officially participates in the official ceremony to open a new Palestinian embassy in the country. Abbas’s visit comes 22 years since the sharp deterioration in relations between Kuwait and the Palestinian Liberation organization (PLO) that was headed by late President, Yasser Arafat, who did not denounce the invasion but clearly stated that he does not approve of it, but also strongly rejected the use of force against Iraq for invading Kuwait. After raising the Palestinian flag on the embassy during the official ceremony, Abbas said that this is a historic moment in mutual relations between the Kuwaitis and the Palestinians. Abbas added that the Palestinians are proud of the Kuwaiti stances regarding the Palestinian cause, and its hosting of thousands of Palestinians. 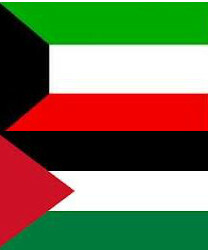 The Palestinian President also stated that the Fateh movement and the PLO “were born in Kuwait and were welcomed by the Kuwaiti people and government”. On his part, Kuwaiti Foreign Minister, Sabah Al-Khaled As-Sabah, stated that Kuwait appreciates, and is proud of the role the Palestinians played in developing the country. It is worth mentioning that Kuwait was a major donor and supporter of the PLO and late President Yasser Arafat who established the Fateh movement while in Kuwait in 1964. The liberated prisoner Rania El Saka accused the PA leadership of depriving her from medical treatment in Italy, stressing that the PA did not provide her with any medical assistance despite her repeated appeals. El Saka's statements came during a press conference on Tuesday in the Jordanian trade unions headquarters, adding that the Health Ministry in Ramallah wastes the prisoners' allocated money on PA officials' trips to Europe. The liberated prisoner suffers from breast cancer where she underwent 23 surgeries and she needs to renew her medical papers in Ramallah to continue her treatment in Jordan. Rania El Sakka accused the Israeli authorities of infecting Palestinian captives with deadly viruses to get rid of them after their release. El Sakka called on the international community and the Palestinian institutions to examine the liberated prisoners' health situation. The liberated prisoner El Saka, a mother of several children, was sentenced to 13 years in Israeli jails for stabbing an Israeli soldier at Qalandia crossing between Ramallah and Jerusalem in 2005. For his part, the prisoner Marwan Barghouthi, a leader in Fatah movement, accused the PA leadership of neglecting the prisoners' issue. Barghouthi, 11 years in Israeli jails, said that the PA leadership has not placed the issue of the prisoners at the top of its list of priorities during negotiations over the past twenty years. Barghouti called on the Ramallah authority to take "a strategic decision" to end the prisoners' file and to liberate all the Palestinian prisoners in Israeli jails. The prisoner confirmed that the Captive movement is in constant tension with the Israeli occupation authorities to defend the prisoners' rights. Meanwhile, prisoners' families in Tulkarem strongly condemned the organization of a conference in support of the prisoners' issue without inviting them to attend it. The prisoners' families stressed that they were not invited by the conference's organizers, denouncing the exclusion policy against them. The families chose to stage a sit-in outside the Red Cross headquarters where they chanted slogans against the conference's organizers, calling for investigating the so-called Supreme Follow up Committee on Prisoners' Affairs for not representing the prisoners’ issue and the suffering of the prisoners’ families. The liberated prisoner Khaled Odeh called on the Minister of prisoners' affairs in Ramallah Issa Qaraqe to bear his responsibility towards prisoners' issue. The PA has organized today a conference on the prisoners' issue under the auspices of the PA Chairman Mahmoud Abbas with the presence of Tulkarm governor, the Minister of prisoners' affairs in Ramallah Issa Qaraqe, and head of PPS Qaddura Fares. Palthink for Strategic Studies organized with self financing a video conference meeting with Mr. Michael Alan Ratney, the U.S. Consul General in Jerusalem. The session was attended by academics, businessmen, civil society representatives, youth activists, community leaders and human right activists. Mr. Omar Shaban, director of PalThink, welcomed the guest and audience and raised a group of issues such as Obama's last visit to the region, the U.S. position regarding the two-state solution in light of continued Israeli settlement building, the future of the region after the Arab revolutions, and U.S. policy toward the Gaza Strip. Mr. Ratney expressed his thanks for the invitation and for the opportunity to address Palestinians from the Gaza Strip, who he recognized live under extremely difficult circumstances. Mr. Ratney emphasized President Obama's visit, adding that his visit indicates how important this region is to American foreign policy. The U.S. Consul General asserted that the two-state solution is the only acceptable solution to the Israeli-Palestinian conflict. He also affirmed the right of the Palestinian people to live in peace and prosperity alongside Israel. He also emphasized that U.S. policy towards Israeli settlement building has not changed, noting that settlements are a fundamental issue that must be resolved and adding that President Obama's speech directly addressed this issue. Mr. Ratney also underscored the continuing U.S. commitment to assist Palestinians in both the West Bank and Gaza. 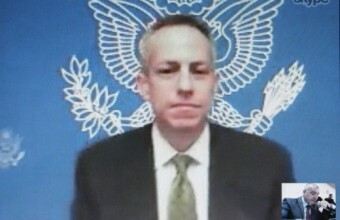 "Our commitment to the economic well-being of Gaza is a central part of U.S. policy," Mr. Ratney added. Right after the Consul's input, the discussion was open and participants raised various questions and concerns regarding the peace process, settlement building in the West Bank, and the US support to Israel. The Gaza participants stressed the need for pushing the Mideast peace process, and called upon the US to play larger and more neutral role in advancing peace, putting an end to the Israeli occupation, and pressuring the Israeli government to stop its settlement and land acquisition policies in the West Bank, which, according to the participants, represent the larger obstacle to peace. One participant also referred to the difficulties facing Palestinians in the Gaza Strip when they need to benefit from the US Consular services. As getting the US visa becomes an impossible mission for people seeking travel to the US because of the restrictions imposed by Israeli authorities on Gazan's freedom of movement through Erez crossing to Jerusalem, and the difficulties associated with heading to the US embassy in Cairo through Rafah crossing. The participant called upon the Consul to help Gazans receive much easier consular services as many students, professionals, and visitors lost opportunities to visit the US during the years of the blockade. At the end of the discussion, the participants expressed their appreciation to the exchange with US consul general , which some of them described the session as a step that contributes in overcoming the blockade imposed on the Gaza Strip. 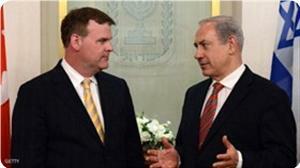 The Palestinian foreign affairs ministry in Gaza has denounced the Canadian foreign minister John Baird for meeting Israeli justice minister in her office in Jerusalem. The ministry described the meeting, in a statement on Monday, as a serious precedence, explaining that it constituted a clear recognition by Canada of Israel’s right to Jerusalem. The meeting came in flagrant violation of all international resolutions and historical constants that affirm Jerusalem as the capital of Palestine, the ministry said and asked the Canadian government to apologize over such a step. The statement urged all free people of the world to stand alongside the Palestinian people until achieving independence and full rights. The Palestinian government considered the upcoming visit of Turkish Prime Minister Recep Tayyip Erdogan to the Gaza Strip next month as "historic, and will have repercussions and far-reaching political implications." Erdogan had formally declared that he will visit Gaza strip at end of next month. Dr. Youssef Rizqa, Political Adviser to the Palestinian Prime Minister, expressed the Palestinian government and people's satisfaction towards "this historic official visit of this great leader Recep Tayyip Erdogan who always stood by the Palestinian people during the Israeli aggression and siege on Gaza and who still supports the Palestinian people." He pointed out to the expected preparations to receive Erdogan who is welcomed by all Palestinians in Gaza, occupied West Bank and Jerusalem, in occupied Palestinian territories of 1948, and in Diaspora, adding that his visit will have far-reaching political implications. Haniyeh's political adviser said that his government would work during Erdogan's visit to lift the political and financial siege on Gaza strip, stressing that getting food into the strip is not considered a removal of the siege. 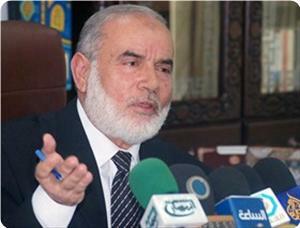 Senior Hamas official Salah Al-Bardawil categorically denied there were understandings with Fatah faction about the date of the elections and the formation of the new government. Bardawil added in a press statement to Quds Press that the resignation of Salam Fayyad from his post as head of the Palestinian authority government had nothing to do with any reconciliation agreement. "What was claimed by director of the reconciliation file from Fatah Azzam Al-Ahmed in this regard is beyond reality and like a smoke screen to confuse things," Bardawil stated. "There is no agreement at all on the date of the elections and the formation of the government, and the resignation of Fayyad was not related to the reconciliation. All these are unfounded allegations" he added. "The reconciliation has reached a stalemate and it is in the pocket of the US secretary of state John Kerry who asked to give him a three-month timeframe for the restart of the talks between the occupation and the Palestinian authority. This is unfortunately a new game played by the American administration in coordination with the occupation to buy some time in order to Judaize the holy sites and occupy more Palestinian lands," the Hamas official underlined. He added that the PA is involved in this game through its political agenda which is far from reality. 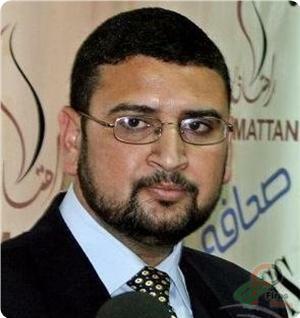 For his part, Hamas spokesman Sami Abu Zuhri reiterated his Movement's readiness to execute the Doha declaration as part of the reconciliation agreement fully and not selectively. "The reason behind the stalemate of the efforts intended to implement the reconciliation agreement is the selectivity policy pursued by Fatah faction when it deals with the reconciliation agreement," spokesman Abu Zuhri stated on Sunday. "If Fatah committed itself to implementing the agreement fully, and respected our people's right to have simultaneous elections for the PLO and the PA according to the agreement and not only for the PA, this would provide a new opportunity to push forward the reconciliation efforts," the spokesman added. Dr. Ahmed Bahar, the first deputy speaker of the Palestinian legislative council, said that the Salam Fayyad government in Ramallah had been usurping power in the Palestinian Authority over the past years. He explained in a press release on Sunday that any government that does not win the PLC confidence is not legitimate. He said that the government of Fayyad, which tendered its resignation on Saturday, should not be called a government and could not turn into a caretaker government because it did not pass the PLC confidence vote according to the law. Bahar said that the 11th unity government led by Ismail Haneyya was the caretaker government after it won majority of votes at the PLC. Bahar asked PA chief Mahmoud Abbas to open the doors of the PLC headquarters in Ramallah and to allow the change and reform parliamentary bloc, affiliated with Hamas, to proceed with their work inside the PLC in a bid to open the way before accomplishing national reconciliation. Turkish Prime Minister Recep Tayyip Erdogan on Sunday announced plans to visit Gaza at the end of May, possibly after a key trip to Washington which brokered a rapprochement between Turkey and Israel last month. 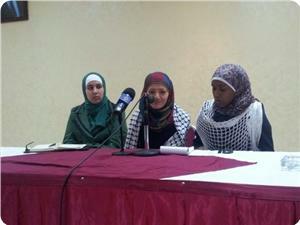 "God willing, we will be in Gaza at the end of May. We will embrace one another there," Erdogan said through a video link with a Turkish aid centre in the coastal territory media reported. Erdogan, a staunch advocate of the Palestinian cause, earlier said he would visit Gaza in April "to help the process" of lifting an Israeli embargo on Gaza. That announcement came a day after a breakthrough apology on March 22 from Israel for the deaths of nine Turks during a 2010 raid on a Gaza-bound aid flotilla, which had wrecked ties between the former allies. Aides pointed to scheduling conflicts for the scrapping of the April visit, but Israeli and Turkish media speculated that US Secretary of State John Kerry had warned Ankara over the trip's "potentially adverse effects" on the new thaw in bilateral ties facilitated by Washington. Erdogan plans to visit Washington on May 16. For full restoration and re-appointment of its ambassador in Israel, Ankara insists that Israel pay compensation for the raid victims and lift its restrictions on Gaza. Officials from both sides are set to meet on April 22 in Turkey to discuss the terms of such compensation. Turkish officials had also postponed that meeting, originally planned for April 11, citing scheduling conflicts. In Gaza City, Hamas deputy prime minister Ziyad al-Zaza told reporters that he hoped Erdogan's visit would present "new possibilities for ending the (Israeli) siege" which he said was costing the economy $250 million per month. He said that Israel had closed Kerem Shalom, Gaza's only commercial crossing, for 16 days in March, and for five consecutive days in April. "What enters Gaza through those crossing is between 35 to 50 percent of Gaza's needs, whether it is food, cooking gas or construction materials for international institutions, which is not enough to reconstruct Gaza," he said. A cautious Erdogan also told reporters on Sunday that "Israel does not appear to be keeping its promise," referring to a pledge by Israeli Prime Minister Benjamin Netanyahu to continue lifting restrictions on goods if calm prevailed. Fayyad represents the unreal part of the problem. Now, with his removal, PA Chairman Mahmoud Abbas will have to be the cannon fodder himself, or find another Fayyad-like figure that would have to satisfy the Palestinian Main Street and be acceptable to Israel and her guardian-ally, the United States. This is certain to be a near impossible task. It is widely believed that a combination of political, personal and health problems lie behind the resignation of Palestinian Authority (PA) Prime Minister Salam Fayyad. However, Fayyad's increasingly bad chemistry with his boss, PA Chairman Mahmoud Abbas, is understood as the main reason behind his dismissal. Fayyad is American-educated and is versed in financial management. Abbas, on the other hand, is an accomplished PLO executive with a different style of thinking. The fact that the two have been able to work together as a team since 2007 is not attributed to harmony and concordance but rather to other exterior considerations stemming from the need to satisfy western donors and keep foreign aid flowing. Needless to say, without the vital financial aid from the West, the PA can't survive. Last week, Abbas was quoted as saying that Fayyad had two choices: either resign himself or reinstate the Minister of Finance Nabil Qessis. 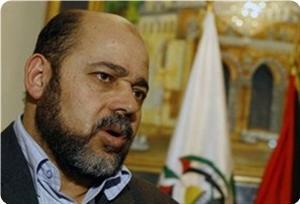 Qessis, whom Fayyad viewed as "non-conformist" had earlier offered his resignation from the government. 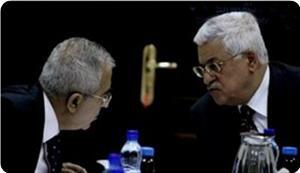 Abbas refused to accept the resignation but Fayyad accepted it rather promptly. Abbas's "less than respectful remarks" reportedly convinced Fayyad that "enough is enough" and that this time there was no chance for reversing his resignation. For years, Fayyad was caricatured as America's man in Ramallah. It is rumored that during one acrimonious meeting of the Palestinian leadership, Fayyad warned Abbas against berating him, telling him "You didn't put me in this job, George Bush did." Last week, U.S. Secretary of State John Kerry telephoned Abbas to press him to find a common ground with Fayyad. The miscalculated American move was probably the straw that broke the camel's back. According to unnamed Palestinian officials quoted by the pro-PA Maan News service, both Fayyad and Fatah officials were incensed by Kerry's call, which portrayed the Prime Minister as "an American agent or puppet." Azzam al-Ahmad, an outspoken Fatah leader, described Kerry's call as "a humiliating and degrading interference by the United States in internal Palestinian affairs." "We know the U.S. interferes in the internal affairs of many nations. However, in our case, American interference is especially insulting. This is unacceptable to say the least. 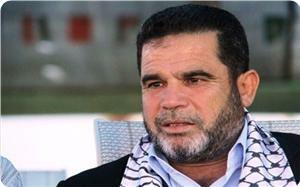 Palestinian leaders must always be answerable and accountable to the Palestinian people not to any foreign power." It is uncertain who will be the next Palestinian Prime Minister. Two names have been circulating in the local Palestinian media, including Rami al-Hamdalla, Rector of the al-Najah University, often described as a rubber-stamp in Fatah's hands. The other potential candidate is Muhammed Mustafa, head of the Palestinian Investment Fund. He is a long-time economic advisor of Abbas and widely considered a skilled financial manager who, unlike many other PLO operatives, hasn't been stained with the stigma of corruption. However, qualifications and proximity to Fatah won't be sufficient credentials for the new Prime Minister. According to one Palestinian commentator, the most important qualification of the new Prime Minister is "Israeli and American backing." This backing, opines the commentator, doesn't have to be brazen in nature. "But we should be quite honest, no Palestinian government or prime minister can function for a long time without Israeli and American acceptance." In addition to this "acceptance," the new prime minister would have to enjoy popular backing from the Palestinian Main Street, especially the Fatah movement and other PLO factions. Moreover, there would have to be a semblance of coexistence between the new prime minister and Hamas, without which no smooth functioning of the upcoming government can be guaranteed. Needless to say, finding a candidate that would meet all these requirements will be very difficult, to put quite mildly. One of the main tasks the new prime minister will embark on is the organization of elections in the West Bank. However, it is uncertain how true representative elections can be held without a clear and lasting reconciliation between Fatah and Hamas, and also without coordination with Israel. Israel is already saying it won't allow polls to take place in East Jerusalem and that it might round up Islamist candidates affiliated with Hamas. The PLO and the entire Palestinian political establishment stand powerless in the face of these challenges. On many occasions, the outgoing Palestinian premier defended himself against disparaging criticisms, especially with regard to his economic policies, by stressing that he was only carrying out instructions from Mahmoud Abbas. Fayyad may have a point in this regard, but he is often perceived to have gone too far in pretending that the PA is actually a state or quasi state when in fact the Israeli occupation army still controls every nook and cranny in the West Bank, rendering the task of Palestinian state-building utterly impossible. Fayyad may be brilliant as an economic or financial manager, but he has displayed a great deal of naïveté in presuming that he could build a prosperous economy under a crippling foreign military occupation. His job is as impossible as throwing a man, thoroughly handcuffed and foot-shackled, in a pool of water and asking not only to remain afloat but also not to get wet. 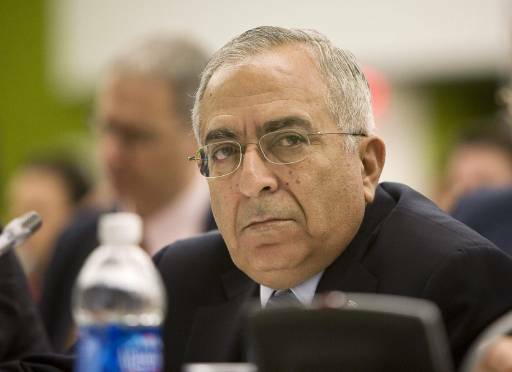 PA chief Mahmoud Abbas is expected to appoint Mohammed Mustafa, former chairman of Palestine Investment Fund, as head of the PA government in Ramallah, following Salam Fayyad's resignation, informed sources said. Mohammed Mustafa resigned from the presidency of the Investment Fund three days ago, and met with the US Secretary of State John Kerry where they agreed on invigorating the Palestinian economy after taking over as prime minister, sources told PIC reporter. The sources added that the removal of Fayyad from his position and his replacement by another economic Fatah leader strongly associated to US policies aimed to maintain the U.S. policies. The Americans were informed by this step requested by Abbas during US president Barack Obama's recent visit in order to change the PA image in the West Bank. The sources said that Salam Fayyad and Muhammad Mustafa have both worked in the World Bank and international and domestic economic institutions. European countries as well as the US and the occupation were informed previously by this step which is not in any way related to the reconciliation process. 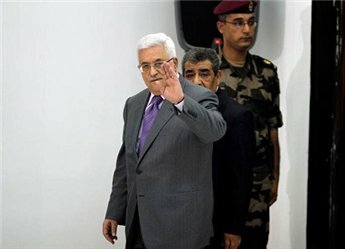 Palestinian President Abbas has accepted PM Fayyad's resignation on Saturday evening few days after offering it due to internal disputes between Fayyad and the Fatah movement. Abbas held a twenty minute meeting with Fayyad, at the Muqata government compound in Ramallah on Saturday evening, during which he accepted the resignation and asked Fayyad to stay on as caretaker until a new government was formed. The Hamas Movement said the resignation of Salam Fayyad as head of the de facto government in the West Bank and its acceptance by president Mahmoud Abbas had nothing to do with the Palestinian reconciliation. "The acceptance of Salam Fayyad's resignation by Mahmoud Abbas has nothing to do with any reconciliation agreement; it is only related to differences between Fatah and Fayyad, and the former's call for dismissing him as it clearly stated in the last meeting of its revolutionary council," Hamas spokesman Sami Abu Zhuri stated in a press release. The spokesman underlined that the execution of the last reconciliation agreement depends on the readiness of Fatah to be committed fully and not selectively. In this regard, political advisor to the Palestinian premier in Gaza Yousuf Rizqa also told Quds Press that Fayyad's resignation had nothing to do with any reconciliation agreement and happened as a result of the political tension between power centers in the Fatah-controlled Palestinian Authority in Ramallah. "The reconciliation had stalled ahead of the visit of US president Barack Obama to the region because of Obama's position against the reconciliation [with Hamas] and Abbas's selective attitude towards the reconciliation files," Rizqa stated. President Mahmoud Abbas Saturday accepted the resignation of prime minister Salam Fayyad and asked him to stay on as a caretaker government until a new one is formed. Fayyad submitted his resignation during a meeting with Abbas at the presidential head quarters in Ramallah. Abbas stressed his high confidence in Fayyad and thanked him and his government for their efforts and hard work, praising the achievements of Fayyad’s government in serving the national project and the building of the institutions of the independent State of Palestine during the difficult times. Fayyad expressed his deep appreciation for the confidence and ultimate support of Abbas to the work of the government during the past years. President Mahmoud Abbas Sunday accepted the credentials of Argentinean, Brazilian, Turkish, and Swiss ambassadors at the presidency headquarters in Ramallah. Sakir Torunlar of Turkey, Eduardo Demayo of Argintina, and Paulo Franca of Brazil are the new representatives of their countries to the state of Palestine. Abbas also accepted the credentials of the Swiss Ambassador to the Palestinian Authority (PA), Michel Gottret. Palestinian Authority prime minister Salam Fayyad formally presented his resignation to president Mahmoud Abbas on Saturday, a Palestinian official said. "Fayyad met Abbas for half an hour in the president's headquarters in Ramallah in the West Bank and officially handed him his written resignation," the official told AFP. Abbas and Fayyad have been at loggerheads as criticism of the prime minister's economic policies has mounted in the ruling Fatah movement, but Washington has lobbied hard for the US-educated economist to remain in post. Late on Friday, US Secretary of State John Kerry telephoned Abbas to press him to find common ground with his prime minister, Palestinian officials said. Rumors that Fayyad would either resign or be told to step down by Abbas have been rife in recent weeks after longstanding differences between the two men came to a head over the finance portfolio. 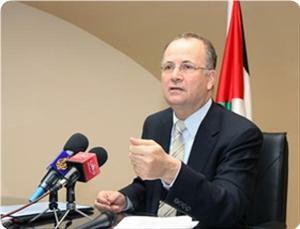 Finance minister Nabil Qassis announced on March 2 that he was standing down. 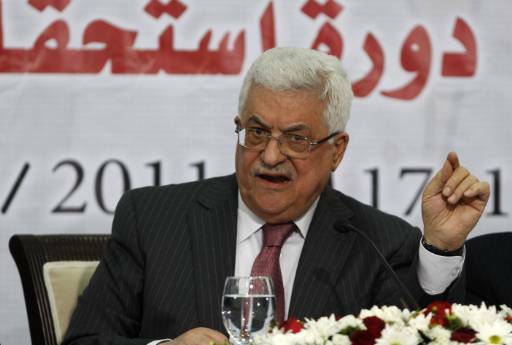 Fayyad agreed to the resignation but Abbas, who was abroad at the time, rejected it. Fayyad held the finance portfolio as well as the premiership before Qassis's appointment in May 2012. A planned meeting Thursday at which a senior Fatah official had said Fayyad intended to hand in his resignation was postponed after Washington insisted that to the best of its knowledge the prime minister was "sticking around". Last week, the Fatah Revolutionary Council for the first time openly criticized the Fayyad government's economic policy. Abbas's Palestinian Authority is in serious financial crisis, partly as a result of non-disbursement of promised foreign funding, although the US Congress quietly unblocked $500 million in aid last month. The international community credits Fayyad with building a sound institutional framework for the Palestinian Authority in the areas of the occupied West Bank under its control. His resignation could hamper implementation of an agreement with Israel which Kerry announced this week to "promote economic development in the West Bank." Palestinian President Mahmoud Abbas faced pressure from Western allies on Thursday not to let Prime Minister Salam Fayyad quit at a time when Washington is seeking to resurrect Middle East peace talks. A spokeswoman at Fayyad's office declined to comment on the reports, which followed persistent rumours that Abbas wanted to sack Fayyad following internal political wrangling. Initially successful in revitalising a sluggish Palestinian economy, Fayyad ran into trouble last year when Israel and the United States withheld vital funds to punish the Palestinians for seeking de facto statehood at the United Nations. Abbas's Fatah party accused Fayyad of failing to foresee the turmoil and the party's council issued an unprecedented rebuke last week, saying: "The policies of the current government are improvised and confused in many financial and economic issues." When he visited the West Bank last month, U.S. President Barack Obama explicitly described both Abbas and Fayyad as "true partners" in a peace process that he hopes to revive between Israeli and Palestinian leaders in the coming months. U.S. Secretary of State John Kerry also met Fayyad this week during a visit to Jerusalem in an apparent show of support for the beleaguered prime minister. Speaking earlier on Wednesday about the rumours of a division between Fayyad and Abbas, a senior diplomat in Jerusalem said Western aid donors would be very upset to see the respected prime minister leave his post. Fayyad's close ties with the West have irritated senior Fatah officials, who have accused him of trying to build an unassailable powerbase, despite the fact that he had no significant political support amongst ordinary Palestinians. Hamas has repeatedly accused Fayyad of helping Israel to blockade its coastal territory and has never recognised him.